I was in the grocery store picking up the ingredients to make a quick dinner of chicken and yellow rice, and spotted the Trivento Reserve Torrontes 2009 as I walked by the wine aisle. Perhaps it stood out as a white among reds, perhaps I was just in the mood for Torrontes. Whatever the reason, I picked the bottle up, tossed it in the cart, and planned on a light, fun white wine with my dinner. Where does the wine come from? Argentina is known for many wines, and Torrontes is perhaps their signature white. Trivento Bodegas y Vinedos is located in Mendoza, Argentina, in the northern-central part of the country, located at the foothills of the Andes mountains. This wine comes from their Rivadavia vineyard, and is 100% Torrontes grapes fermented 25 days in stainless steel tanks. The Trivento website does not list this wine as one of their releases, and I believe they have recently re-branded the Select line as Reserve. Trivento is wholly owned by Concha y Toro, one of the largest, if not the largest, producer in Chile. What does Trivento Reserve Torrontes taste like? In the glass, the Trivento Reserve Torrontes was a pale yellow and green hue, with a light floral nose followed by orange blossom scents. As it opened and warmed in the glass, those notes mingled with a spiced pear fragrance. The palate, or taste, was crisp citrus and honeysuckle, with a little green grassy note. The acidity was firm, but not bracing, and the finish was short, but pleasant. When paired with the chicken and yellow rice, the green notes all but go away, and the wine becomes more round and a touch more floral. Torrontes, whether this Trivento Reserve or almost any other, goes well with shellfish and seafood, as well as chicken dishes. The winemaker suggests pasta, Thai or Indian dishes. I would recommend a pasta with a light butter and garlic sauce, and not a heavy red sauce. Mexican and Spanish dishes will pair with Torrontes as well, and my chicken and yellow rice worked perfectly. For only $11 in the grocery store, this wine was pleasant enough. It worked fine with the meal, and would be nice on a warm summer afternoon. I wouldn’t, however, let it be the only Torrontes you ever try, as they can vary quite a bit from different areas of Argentina, as well as different producers. 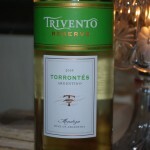 The Trivento Reserve Torrontes was almost Sauvignon Blanc like, with a touch of floral, and not quite as dry. However, don’t take my word for it. Try it for yourself, and leave a comment here with your thoughts. If you can’t find this Torrontes, get another, and let me know what you think!